Cherries and chocolate are ubiquitous on Valentine's Day, and I remember we always had a box of those tooth-achingly sweet chocolate-covered cherries in the house when I was growing up. Observing Valentine's Day without loads of sugar seemed unthinkable. These days, though, I like desserts that let the ingredients shine without being overwhelmed with too much sweetness. 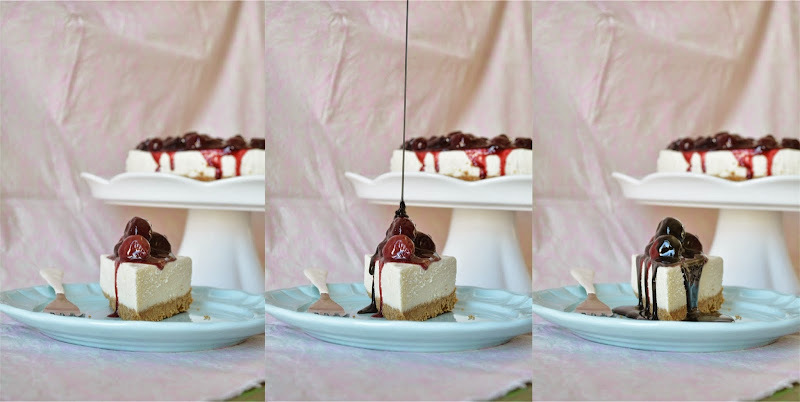 The vanilla bean cheesecake is simple enough on its own, demure but sophisticated with specks of vanilla bean throughout. 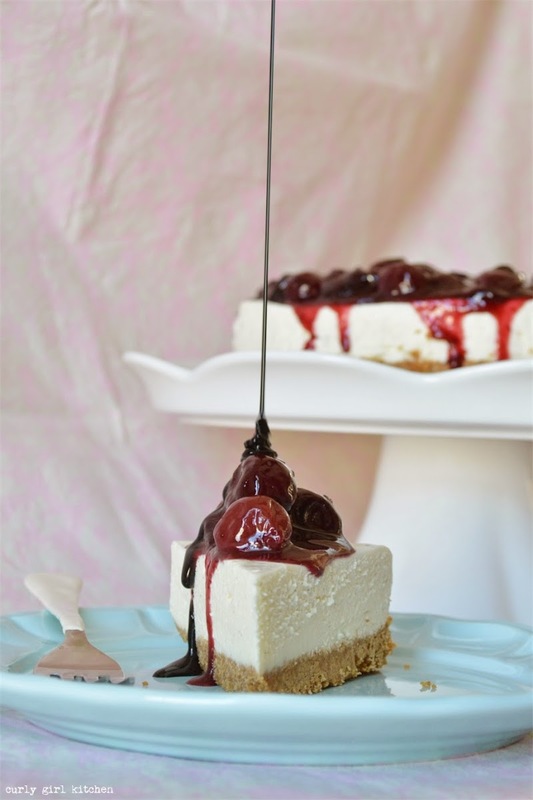 The cheesecake sits on a graham crust, buttery and surreptitiously salty, a pleasant contrast to the sweetness of the cherries. I spiced the cherries with cinnamon and nutmeg, and cooked them until thick like pie filling. 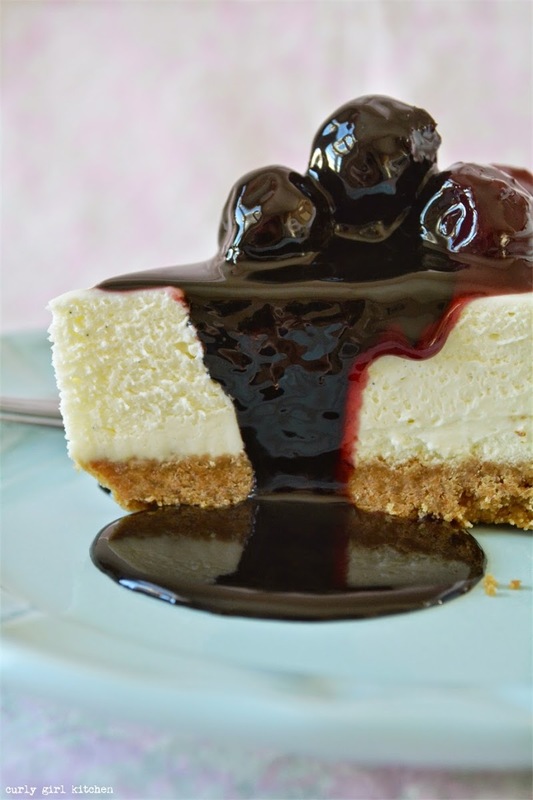 Once cool, I spooned them over the cheesecake, their red juices staining the creamy white filling. Homemade chocolate syrup, dark, rich and bittersweet, is the finishing touch. Poured over top, the chocolate caresses the cherries in its kiss, dripping down into a reflective pool on the plate. This tryst of cheesecake, cherries and chocolate is truly a swoon-worthy dessert, and quite appropriate for the upcoming holiday. Note, all components should be prepared the evening before, so they can chill overnight before serving. Preheat the oven to 325. In a bowl, combine the crushed graham crackers and salt. Drizzle with the melted butter and toss with a fork until moistened. Press against the bottom of an 9-inch springform pan. Bake for 12 minutes, until golden brown and fragrant; set aside to cool completely. Pour 1/4 cup cream into a microwave-safe dish. Add the gelatin and whisk with a fork to combine. Let stand for 5 minutes; it will be thick and clumpy. Microwave on high for 30 seconds to completely dissolve the gelatin. Set aside. In the bowl of your stand mixer fitted with the whisk attachment, beat the remaining 1 1/4 cups cream with the vanilla bean seeds at medium-high speed until soft peaks form, gradually adding the powdered sugar as the cream thickens. Add the cream cheese and gelatin mixture and beat until smooth and thick with no lumps, about 2-3 minutes. Immediately spread over the cooled crust, smooth out the top, cover with plastic wrap, and refrigerate for 4-6 hours, or overnight. In a saucepan, combine the cherries, sugar, cornstarch, water and spices. Bring to a boil over medium heat, stirring often. Once the mixture boils, stir constantly, cooking for a minute or two longer until thickened. Chill completely in the refrigerator. In a saucepan, combine the water, sugar and corn syrup; bring to a boil over medium heat. Reduce the heat to low and whisk in the cocoa powder, espresso powder and salt, whisking until smooth. Simmer on low until the syrup has thickened enough to coat a spoon, about 3-5 minutes (it will also thicken more as it cools). Remove from the heat and stir in the butter and vanilla. Pour into a glass jar and refrigerate. 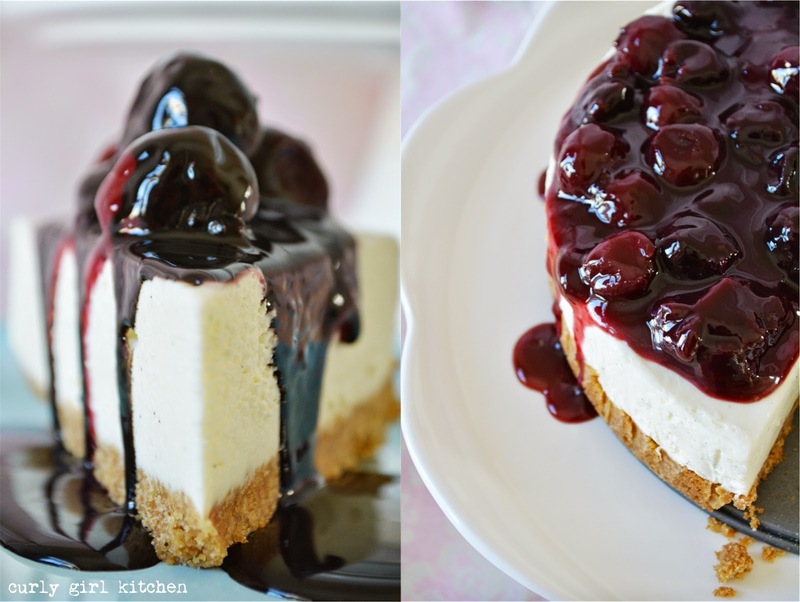 Run a sharp knife around the sides of the cheesecake, and carefully remove the sides of the pan. 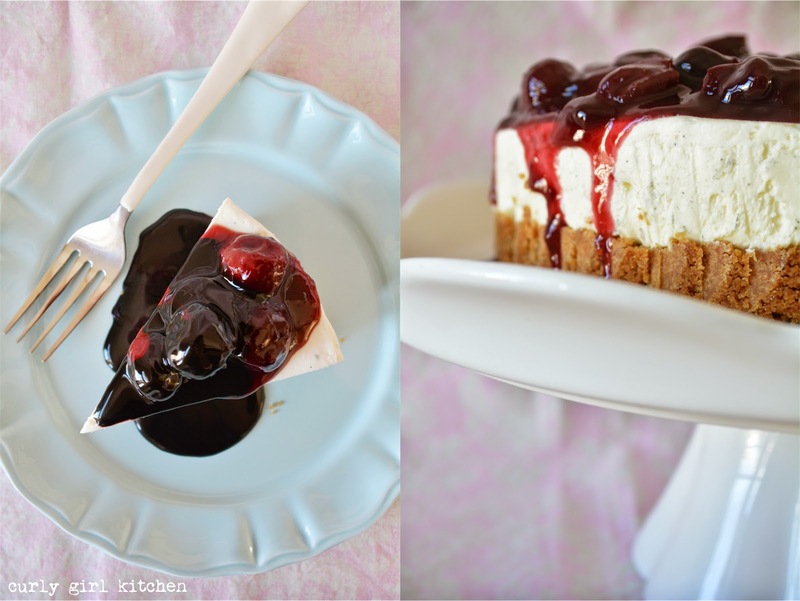 Just before serving, spoon the cherries over the cheesecake, or serve on the side. Serve the chocolate on the side. 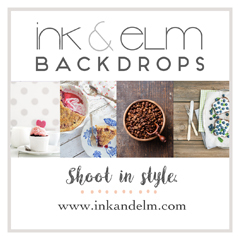 Just found your blog....sooooo beautiful! Your pictures are glorious....and so delicious! When taking cherries, it's important that you should not take too many cherries especially the sweet cherries.